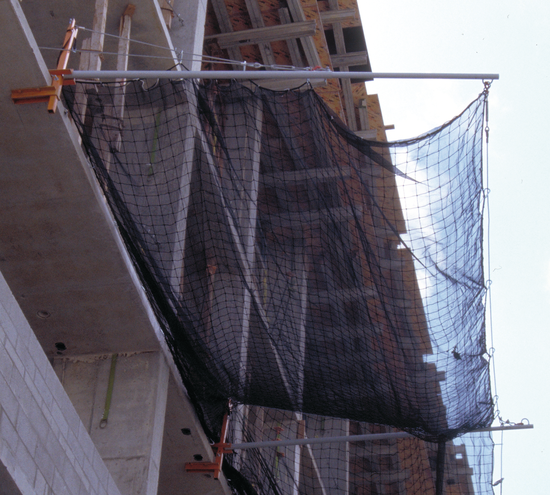 If you were to envision and create the ideal netting solution, your system would likely be designed to reliably catch both falling personnel and debris. DBI-SALA has developed the technology to provide you with a single solution for both personnel and debris; because we all know that falls of either type can be detrimental to a project and a company. Border Guard is a DBI-SALA® exclusive. It’s the first lightweight debris/personnel system made for rigging nets around the perimeter of new concrete buildings. Border Guard™ is a convenient, economical way to ensure protection, confidence and productivity at your building site. It allows single floor attachment for closer protection at the pour level. Unlike alternative systems, Border Guard™ comes in convenient units and installs with sturdy hardware that’s half the weight of the old style net systems. Attaches to existing systems to create corner protection - Connects to existing Border Guard systems on adjacent sides of the building forming a corner and providing debris/personnel protection. 12 x 12 x 17 ft. (3.6 x 3.6 x 5.2 m) net with debris liner - Provides protection for both small and large objects for the ultimate in jobsite and public safety. Includes cable assembly and snap hooks - We've included all necessary hardware and moutning fasteners to anchor the net system to the floor clamp and arm assemblies. Starter and add-on kits also available - Separate kits are available to extend your system across an entire building face and even around a corner.